Bicycle! Bicycle! 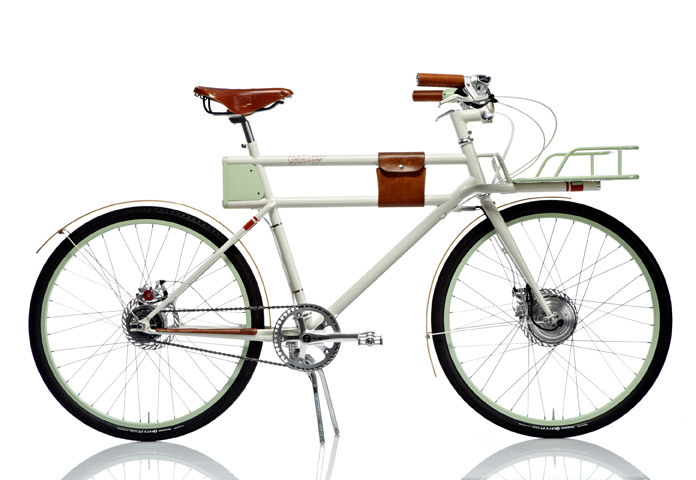 : A Really, Really, Ridiculously Good-Looking E-Bike? A Really, Really, Ridiculously Good-Looking E-Bike? Please go there so I feel better about using their picture. When was the last time you saw an e-bike that looked so good? The Faraday Porteur is revolutionary for many reasons and you can read about all of them either on their Kickstarter page or their website but I'll summarise a few here. Firstly, the batteries are INSIDE the double top tube of the frame, solving the usual e-bike problem of chunky blocks squatting over the rear tyre or in the case of DIY e-bike kits, giant bricks wedged below the seat. That little green bit at the back is where the plug for recharging is housed. 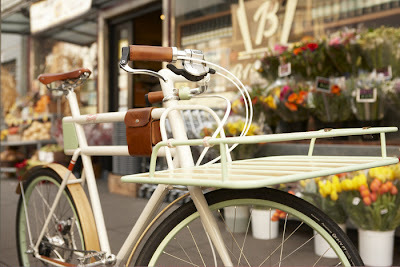 And check out the lovely leather pouch on the top tubes - charming! Not to mention the Brooks saddle and leather grips. A 21st Century bike with a firmly vintage aesthetic. I love the cream and mint colour scheme too. Unisex enough that the rider will push it either way. Secondly, note the portage friendly features like double kickstand and front rack with weight distributed through the frame rather than down on the front wheel. This allows for heavier loads. If you check out the video on the Kickstarter page, you'll see that the front carrier is even detachable for when you want a narrower profile or lighter bicycle. The creators plan to release other accessories to click into the same quick release as the rack for a future of customisation and even pet carrying! Also proving its street cred, the Faraday Porteur has built in LED lighting. Two at the front (see the support tubes under the front carrier? The lights are inside there!) and red at the rear. Another detail which adds to the Faraday Porteur's charm includes the complete lack of a giant computer screen, a thing which often plagues e-bikes. Instead there is an understated 'virtual ink level' next to the electronic assist switch which is itself a minty green little thumb shifter on the handlebars, very subtle. The fenders/mudguards are made of wood, an interesting choice. They certainly look pretty even if it feels a little gimmicky. I wonder if that was a weight reducing choice? I also wonder just how much protection that chain ring would offer - maybe they should have busted out a wooden chain case! I jest. I do like the clean look of it, though. You can really tell this is a 'Designer's bike' as well as a triumph of technological geekery. Dare I type it? It reminds me of a certain fruit-themed company that successfully combined attractive design with ease of use and innovative technology. as a significant leap forward for e-bikes. I really hope this re-imagining of an e-bike takes off for the people at Faraday and perhaps inspires greater change in the e-bike industry. I'd love to see more traditional looking e-bikes offered as an attractive, prestige alternative to cars. The Kickstarter page says the Faraday Porteur is going to retail for almost US$4000 which is confrontingly expensive until you take into account the fact that it's made domestically (as far as they are concerned) out of high quality materials and parts, is an e-bike and is a fully loaded utility bike in a vintage inspired style. Best of all, the video boasts that the Faraday was bred to tackle the infamous hills of San Francisco - As a Tasmanian, that is definitely technology I can get behind.